"Essential Witness reminds the reader of what quality, talent, and technical expertise meant in photography and with America's railroads as a subject." Railroads and photography came about at almost the same time, and the grand drama of trains still draws the camera. Jim Shaughnessy eventually shot some 100,000 American railroad images for "scores of magazines and books, fine art prints in a number of collections, and thirteen appearances on the cover of Time." Essential Witness as a coffee table quality book draws the viewer into Shaughnessy's photographs with "every nuance and detail." The reader has difficulty leaving one image for the next because so much went into each from the power of a steam locomotive to the automobiles parked by the tracks to the reflections in puddles. Jim Shaughnessy's work documents history on different levels including the "wrenching shift from the steam locomotive to the diesel" in the 1950s and the changes in "the surrounding railroad landscape." He often includes the train stations. Purists mistakenly believed that the drama of railroads would leave with steam engines. The introductory narrative of this artist's work by Kevin P. Keefe makes for an engrossing story when the reader can tear away from viewing the photographs. Keefe discusses not just Shaughnessy 's connection with trains but this artist's education in the cameras and photography of his era for day and night. 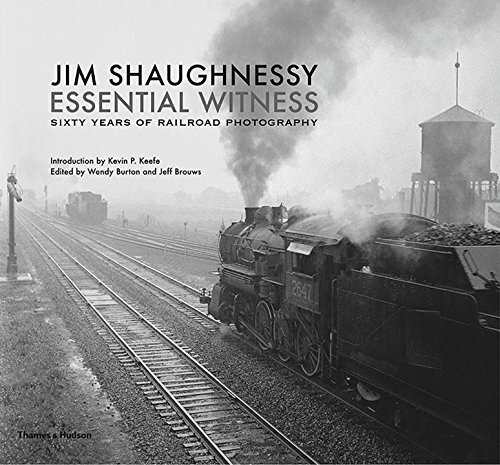 Born and raised in Troy, New York, Jim Shaughnessy developed a passion for trains as a boy and professional quality photography of all things railroad as an early passion, long before he went on to college to study as an engineer. Troy "was blessed with a variety of railroads" and it has "a deep industrial heritage." Not just someone with a camera and a love of trains, Shaughnessy's "expertise went beyond the moment of snapping the shutter." He "became a technical master" and "an artist in the darkroom" even if printing proved "a laborious, solitary duty." Shaughnessy and Trains magazine mutually benefitted from his starting his career in railroad photography with that journal in 1952. It had an "increasingly lavish use of photographs." From there, his highly regarded work found even greater acceptance including books such as his The Call of Trains. With all of the digital toys available today, photography has too often degenerated into cell phone level mediocrity. Essential Witness reminds the reader of what quality, talent, and technical expertise meant in photography and with America's railroads as a subject. Essential Witness includes captions but also a glossary with more information on each photograph.